Persistence Market Research (PMR) provides an exclusive analysis of the global testing, inspection and certification market, in its revised report titled 'Testing, Inspection and Certification Market: Global Industry Analysis 2013–2017 and Forecast 2018–2028'. The main aim of this report is to offer an exhaustive analysis and insights pertaining to the testing, inspection and certification market. 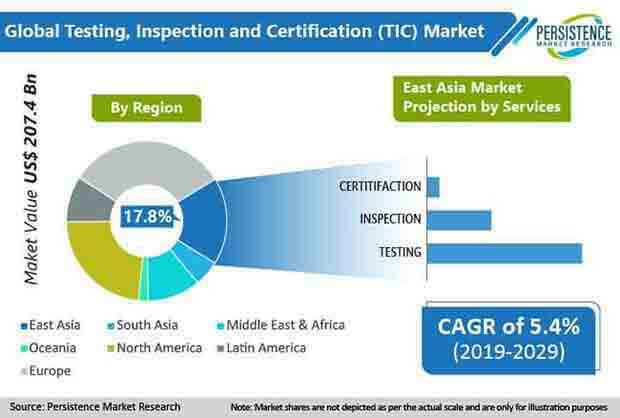 This report offers a comprehensive analysis of the global testing, inspection and certification market in terms of market value (US$ Mn) and year-wise (Y-o-Y) growth in the global testing, inspection and certification market on the basis of service, sourcing, and application. The study considers 2017 as the base year, with testing, inspection and certification market values estimated for 2018, and a forecast developed for the duration of 2018 to 2028. The compound average growth rate (CAGR) has been represented from 2018 to 2028. The study covers testing, inspection and certification market dynamics, value chain analysis, and industry growth analysis, along with segmental-level projections in a comprehensive manner. As per industry experts and findings of the report, the global testing, inspection and certification market is expected to witness a moderate growth rate in the near future, and is anticipated to grow at a CAGR of 5.3% between 2018 and 2028. The research report on the testing, inspection and certification market analyses the market at a global as well as regional level, through market segmentation on the basis of service, sourcing, and application. The key objective of the testing, inspection and certification market report is to offer insights on competition positioning, current trends, market potential, statistics, and other relevant information in a suitable manner to readers and prominent stakeholders involved in the global testing, inspection and certification market. The report has been structured to facilitate readers to develop a deep understanding of the testing, inspection and certification market. The report begins with an executive summary, followed by testing, inspection and certification market definitions, market taxonomy, background and macro-economic factors, market dynamics and analysis of the market by key segments, regional market analysis, and competition assessment. Each section of the report covers a qualitative as well as quantitative assessment of the testing, inspection and certification market on the basis of historical trends, key facts, opinions collected from market participants through interviews, and key developments in the testing, inspection and certification market. In the third section, the report describes the key trends in the testing, inspection and certification market, and the next section includes key success factors for service providers. The next section of the report includes macro-economic factors such as economic growth by region, GDP per capita by country, global population outlook, overview of IoT connected devices, evolution of TIC, automotive industry outlook, chemical industry overview, aircraft production outlook, mineral production overview, oil production and consumption overview, forecast factors, value chain analysis overview, etc. The next section of the report provides value (US$ Mn) projections for the testing, inspection and certification market, and absolute $ opportunity analysis at a global level. The subsequent section highlights the testing, inspection and certification market sizing by respective segments at a global level. The global testing, inspection and certification market values represented in these sections have been agglomerated by collecting the information and data at a regional level. Information of the testing, inspection and certification market covers unique analysis frameworks such as absolute $ opportunity analysis, year-on-year growth trend comparison, market share, and attractiveness analysis for each of the sub-types of the segments. The subsequent section of the report presents a summarized view of the global testing, inspection and certification market based on seven prominent regions considered in the study. The market analysis section of the report covers market projections, market share analysis, market attractiveness analysis, Y-o-Y growth trends, and incremental $ opportunity assessment. All the above sections evaluate the present market scenario and growth prospects in the global testing, inspection and certification market. Market numbers, on a regional as well as country level, for various segments, have been estimated through a combination of secondary and primary researches among the target countries. Key sources referred to arrive at the global testing, inspection and certification market size include testing, inspection and certification service providers, industry associations and experts, documents available through the public domain, paid databases, and PMR’s in-house data repository. In order to offer an accurate testing, inspection and certification market forecast, PMR’s proprietary regression analysis forecast model was then utilized to derive the market estimation for forecast years, which takes into account the effects of certain macro-economic factors and direct factors on the global and regional target (testing, inspection and certification) markets. Opinions of market participants about various geographies and segments were also taken into account while forecasting the testing, inspection and certification market size. In the final section of the report, service and application mapping analysis by company, and a competition landscape of the testing, inspection and certification market have been included to provide report audiences with a dashboard view categorized on the basis of providers in the value chain, their testing, inspection and certification market presence, and key strategies being adopted related to testing, inspection and certification in the market. Detailed profiles of the service providers of testing, inspection and certification have also been included in the scope of the report to evaluate the recent developments and key offerings in the testing, inspection and certification market. The testing, inspection and certification market report by Persistence Market Research provides information about market value (US$ Mn) projections, market trends, dynamics, forecast factors, and key developments in the global testing, inspection and certification market for the study period 2018 to 2028. The push towards outsourcing, and in specific instances, the privatization of state-owned laboratories will continue to be a strong driver for the growth of this market. As per estimations, nearly 40% of the overall market is currently outsourced, which is further expected to grow in the near future. Moreover, the increased level of stringent standards and regulations across various application sectors is expected to assist the demand for testing, inspection and certification services over the near future. Key players involved in testing, inspection and certification services are focusing on mergers and acquisitions across the globe. Further, companies are focusing on the expansion of their testing, inspection and certification facilities in emerging economies, especially in China. For instance, SGS SA has announced the expansion in its capabilities with the introduction plant tissue testing and recommendation services for the market in China. The global testing, inspection and certification market has been segmented on the basis of application into consumer & retail, food & agriculture, oil, gas & chemicals, mining & minerals, industrial, transportation, and system certification. The system certification segment is projected to register 1.8X growth over the forecast years in the global testing, inspection and certification market. Revenue generation from industrial testing, inspection and certification services is expected to account for a prominent share, supported by escalating demand from the pharmaceutical and construction sector across Asia Pacific. The oil, gas & chemicals and industrial application segments, together, are expected to create more than half of the total incremental opportunity during the forecast years. Continuous expansion into new markets and developing economies, primarily through acquisitions, and dealing with new tax and legislative regimes are the key factors that are expected to escalate the growth of testing, inspection and certification market in the South Asia and East Asia regions. Europe accounted for a lion’s share in the global testing, inspection and certification market in year 2017, and is expected to continue its dominance over the forecast years. The East Asia market is anticipated to witness maximum growth in the global testing, inspection and certification market. In terms of market value, the market in North America is anticipated to witness 1.7X growth in the global testing, inspection and certification market. Globally, the testing, inspection and certification market is significantly fragmented, with the top 3 providers holding a small share in the global market. The global testing, inspection and certification market has witnessed a large number of developments in the recent past. The introduction of new laboratories and merger & acquisition activities are found to be the key focus areas of prominent testing, inspection and certification service providers across the globe. For instance, in January 2019, SGS SA announced the acquisition of LeanSis Productividad, based in Spain. This acquisition will help the company gain expertise in the field of organizational capacity building. In February 2019, Bureau Veritas SA and Microsoft announced a partnership to launch testing services based on artificial intelligence. How has the testing, inspection and certification market evolved in the past 4 years? How is the testing, inspection and certification market expected to take shape in terms of value over the next decade? What are the market dynamics in the global testing, inspection and certification market? What are the competition developments and key trends identified in the global testing, inspection and certification market? What are the key challenges for testing, inspection and certification service providers? What is the market presence of prominent companies in the testing, inspection and certification market by service and application? What is the market share of the top 10 players in the global testing, inspection and certification market?